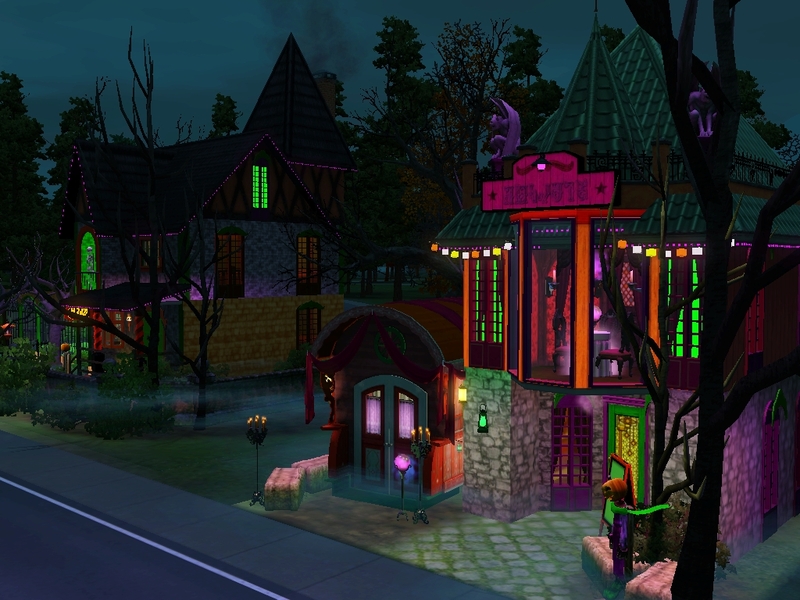 Mod The Sims - *APRIL 17 UPDATE* New Halloween World! Feedback Wanted! 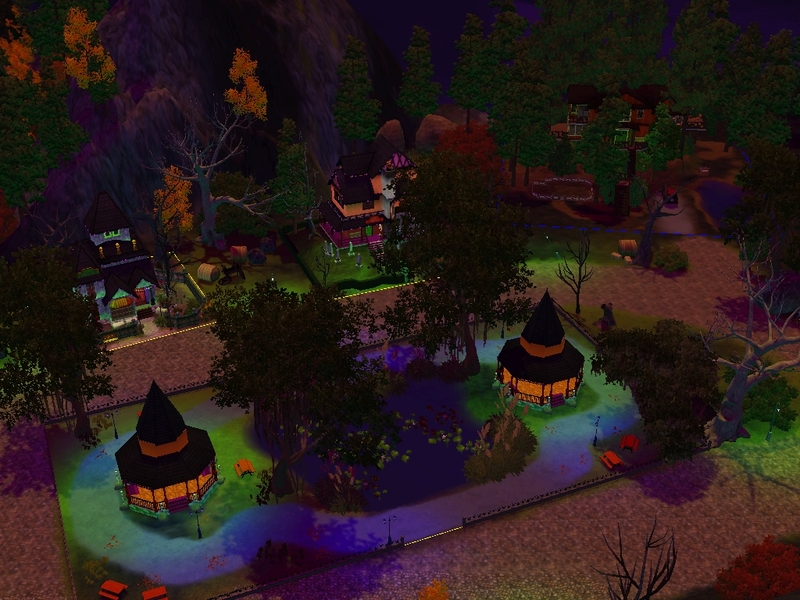 Worlds/Neighborhoods - *APRIL 17 UPDATE* New Halloween World! Feedback Wanted! Replies: 23 (Who? ), Viewed: 908 times. #1 5th Apr 2019 at 11:55 PM Last edited by pancake101 : 17th Apr 2019 at 5:51 PM. 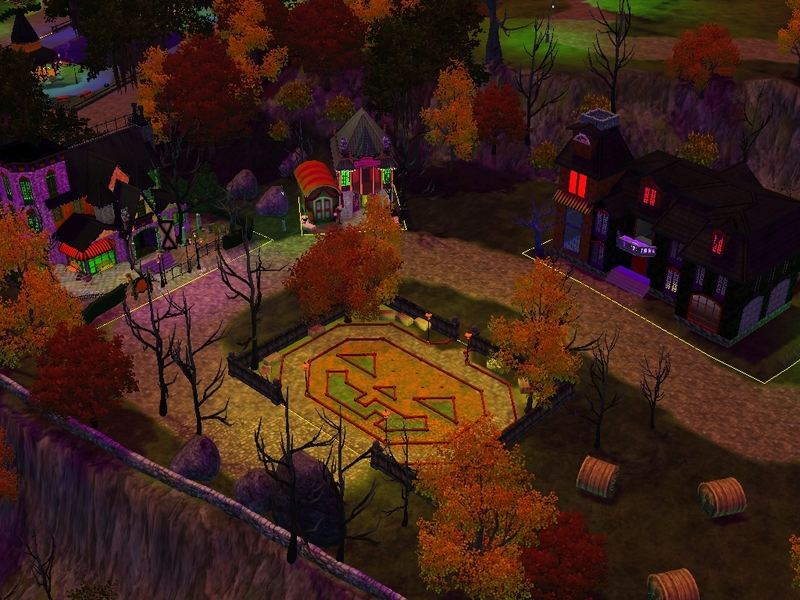 *APRIL 17 UPDATE* New Halloween World! Feedback Wanted! Hi everyone! So I recently decided to try my hand at world building, something I've never done before. 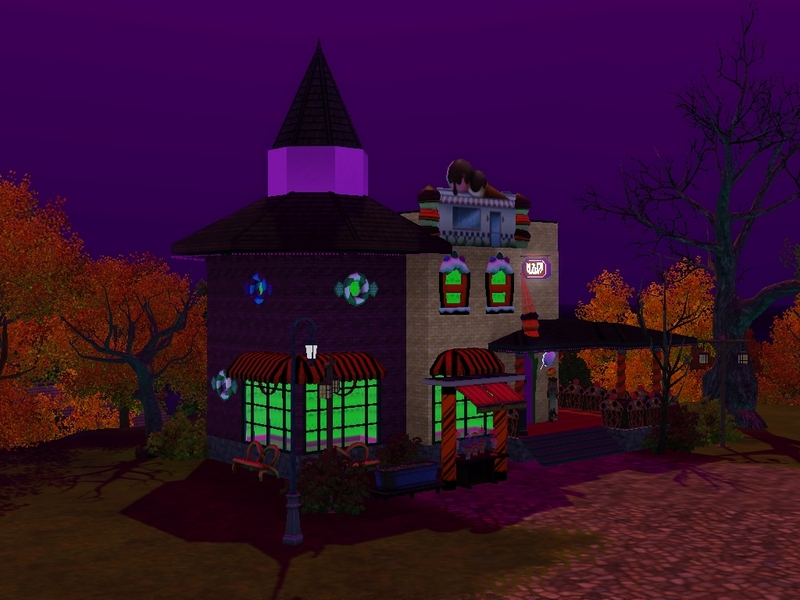 I was inspired to try and create a Halloween themed world back when I created my Lemax and Department 56 Spooky lot series last year. 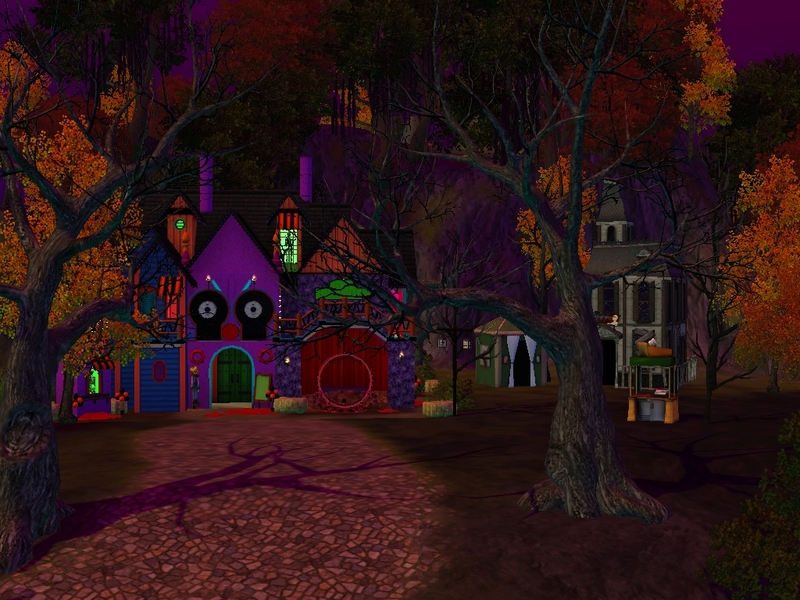 I have built it as a small island world that is year round Halloween themed and includes all the lots I built for my spooky series as well as some newly built lots and a few choice lots from my gallery that fit the theme such as The Academy of the Supernatural, The Halloween Dollhouse House, and the Blood Heart Mansion. I am still fixing the terrain and building a few parts so if they look incomplete that's why. 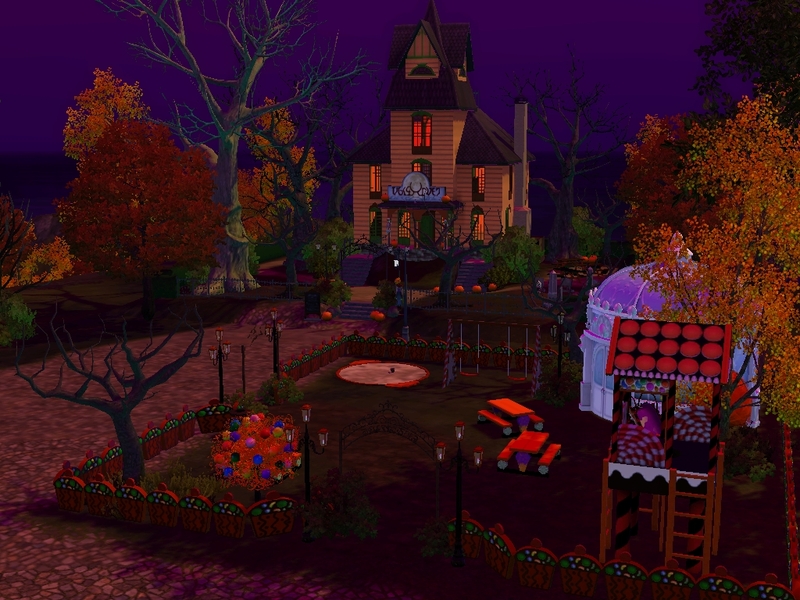 The world will also have custom lighting, water, and sky colors, as well as hopefully a new moon that phases to a jack-o-lantern on its full phase The lighting and colors are still being worked on but you can see in the photos how the regular cloudless weather would sort of look. 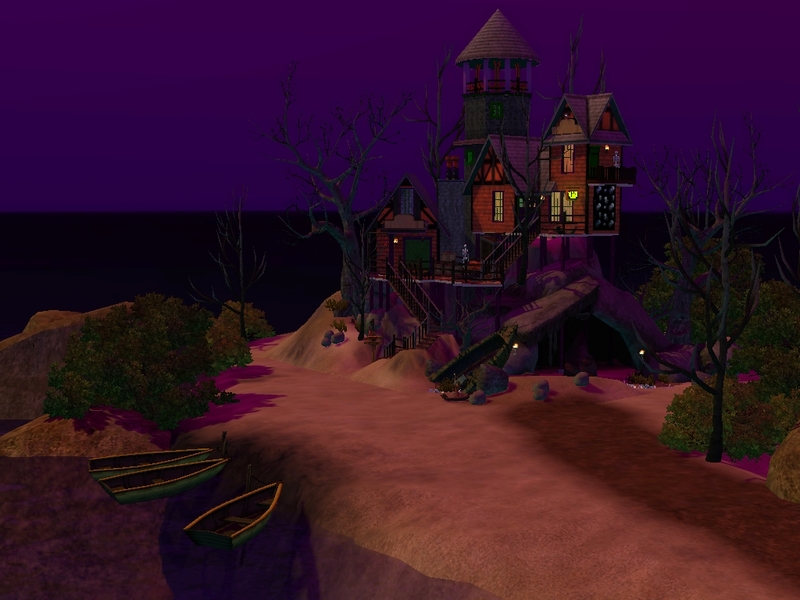 The whole world's lighting is tinted slightly darker and purple to match the sky, again visible in the images. I would love to hear any comments about the lighting or any suggestions as I am still pretty new to changing the .INI files and color ramps. - This world has no store or custom content, but does require all expansions and a few stuff packs including Katy Perry. - There are five types of spawners in the world: Insects, seeds, fish, gems, and nanites. - There are 6 Rabbithole buildings (all from Supernatural) That cover School, Stadium, Fortune Teller, Diner, Grocery, City Hall, Police, Military, Theater, Criminal, Library, and Hospital. 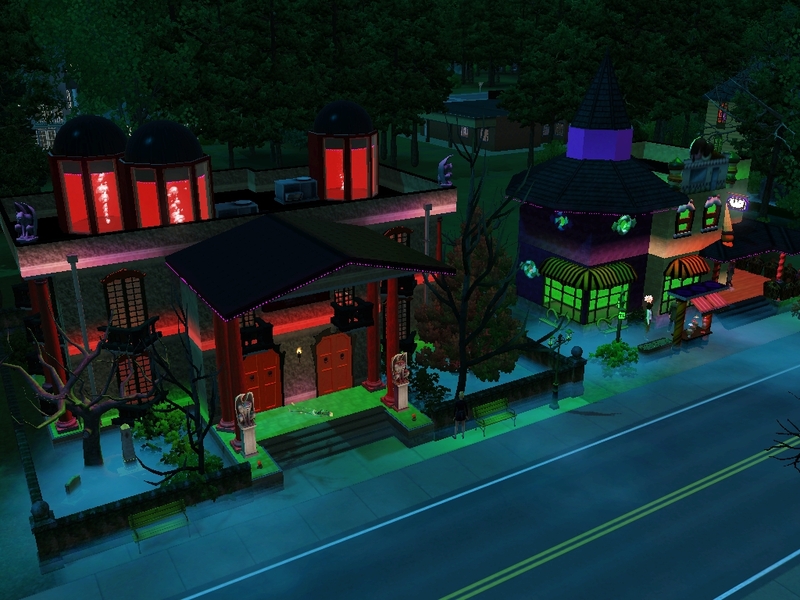 - There are 21 community lots covering most careers including Salon, Tattoo, Gym, Vampire Lounge, Supernatural Hangout, Dive Bar, Small/Big Park, Beach, Show Venue, Coffeehouse, Art Gallery, and Cemetery. Anyway, I would love to hear any feedback on the progress so far. Any comments, questions, suggestion, etc. are welcome and I will probably be uploading new images as I do more work! Hey, you are doing a world! This looks wonderful! I love it. Can we see some day pics also? Actually those are the day pics although probably later in the day xD Like I mentioned it is a fairly dark world. At night the streetlamps glow bright green and the buildings emit lots of colored lights. 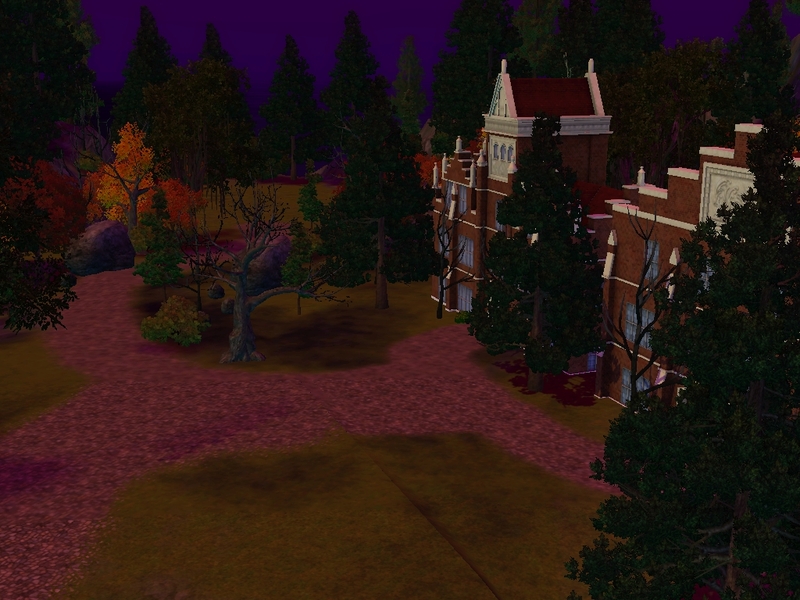 I’m still toying around with the lighting and weather files but I will try and snap some pics around high noon. I love it! Others will weigh in whether this is a bit dark for daytime or not? 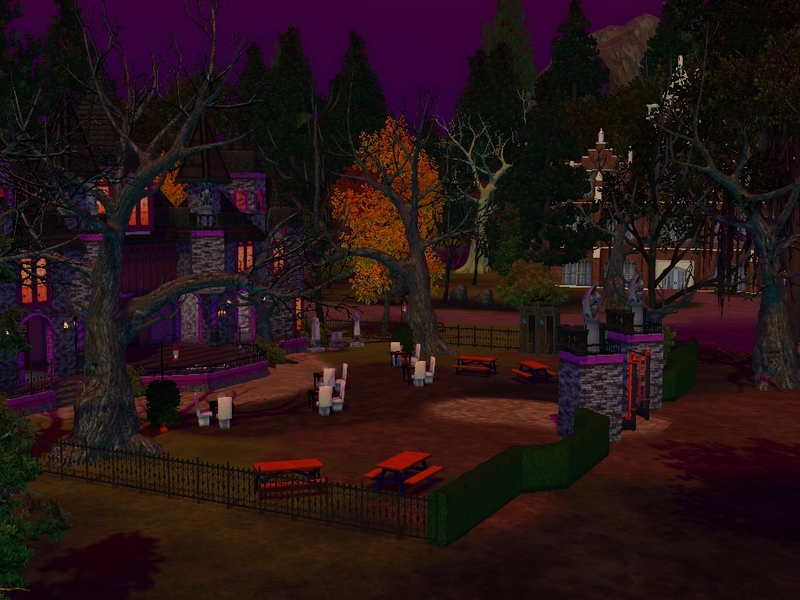 I would love to see the lots with the brighter colors in the day and then the lit versions at night. More contrast. No matter what you decide, it looks GOOD!!!! 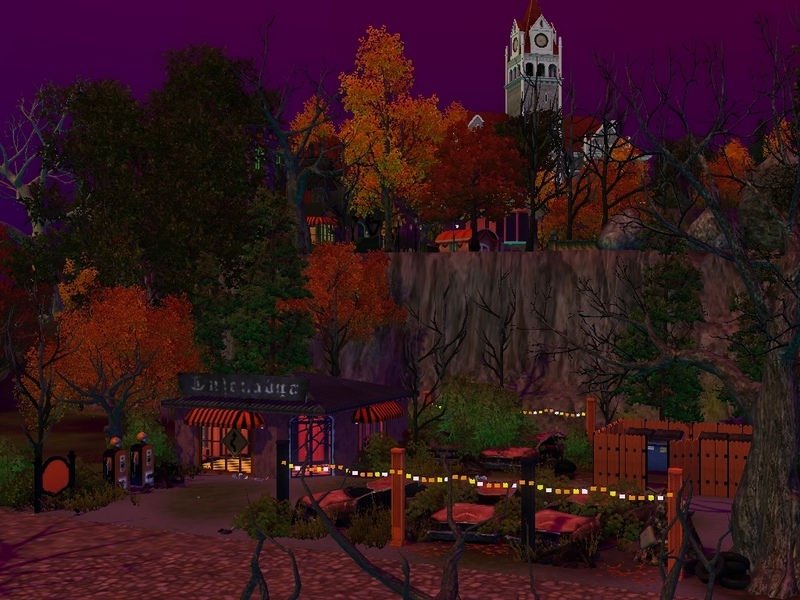 Are you going to add a basecamp so we can use Nraas Traveler and Sims can come and spend a few days here at Halloween, or whenever wanted? Or they will need to stay in houses that are unoccupied? As for a basecamp I hadn’t really thought of it since the lots in this world are primarily small and I don’t have room for any large size lots. I COULD potentially turn the supernatural academy into a base since it has dorms with lots of bunk beds. I know zero about lighting so you know a heck of a lot more than I do. I think a purple sky is perfect for this world. 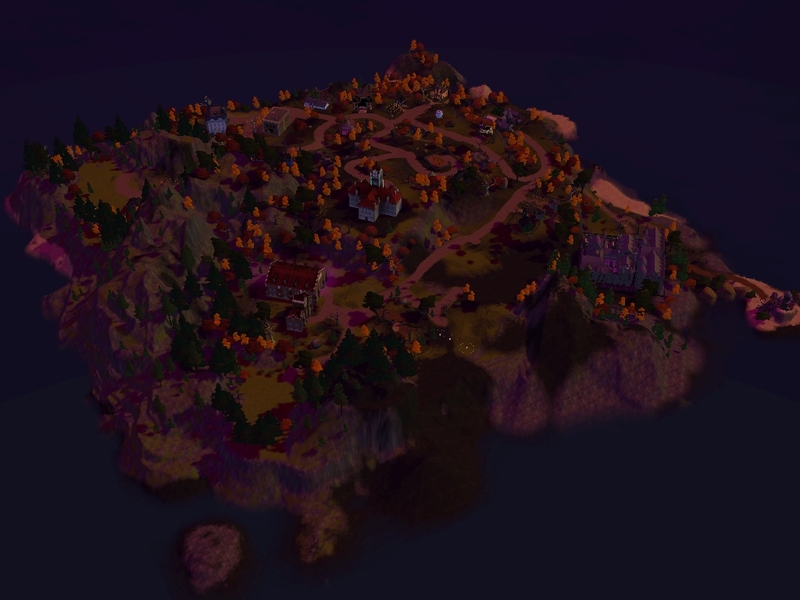 Is there room on the map to add more islands later for more space and lots you will do over the years? So you can add more builds later if wanted? Sounds complicated, and well worth it. Ahh sadly no. This is built on a small map and comes pretty close to the edges as is. 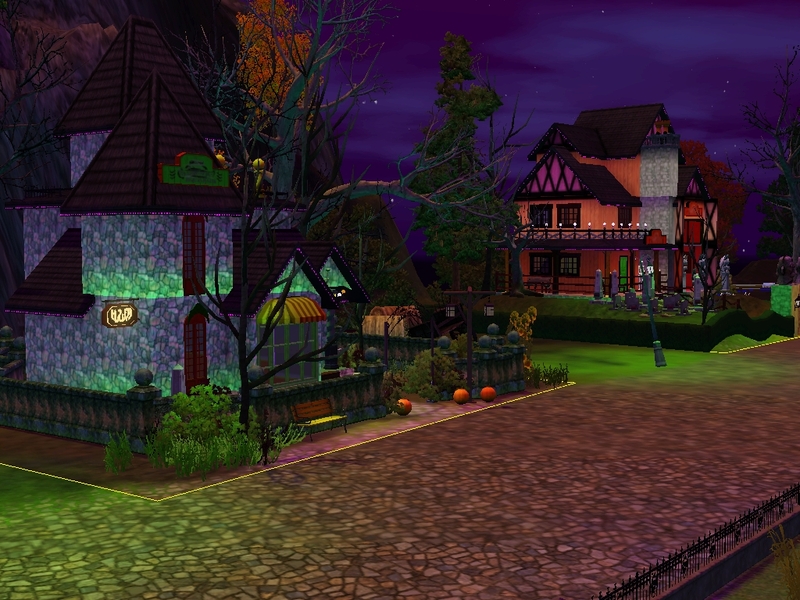 However, the good news is there ARE new Halloween builds being added into the world along with the ones I had made previously. 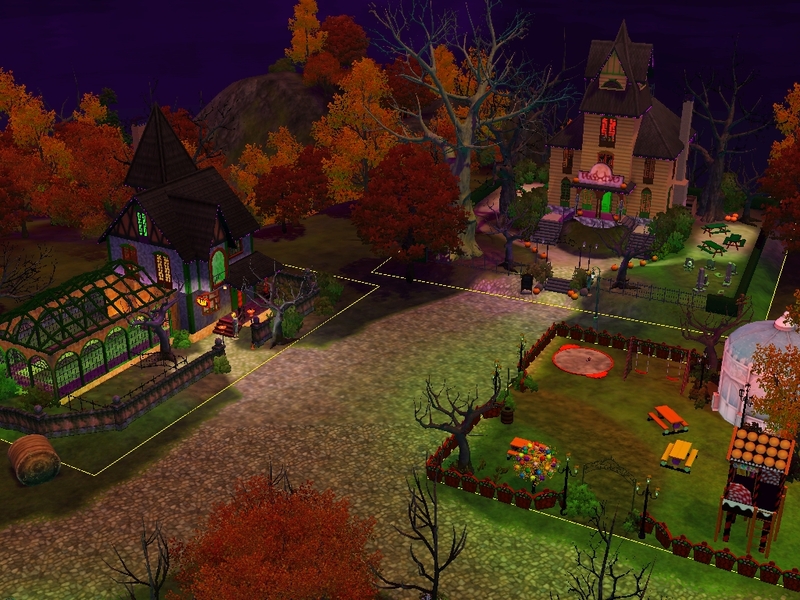 There are some small Halloween houses, a salon, gym, graveyard, parks, ETC. 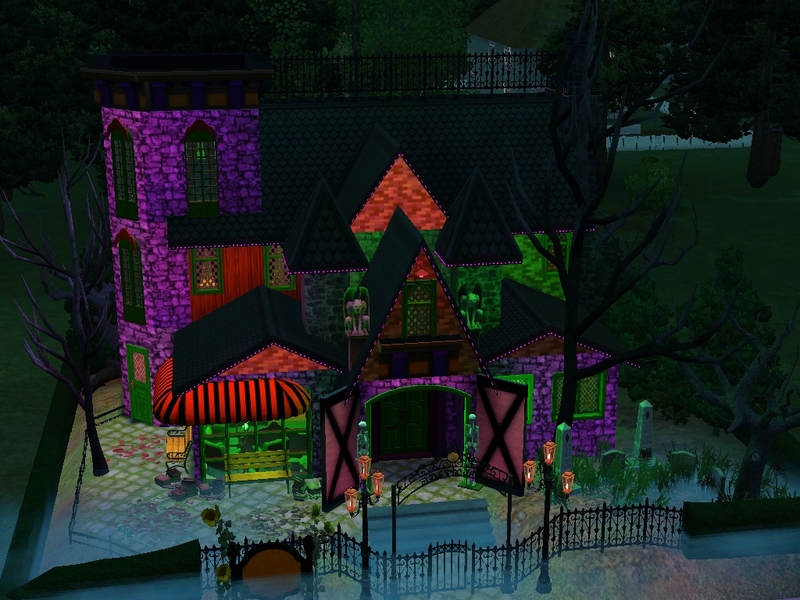 all built in the same spooky themes as the original series. 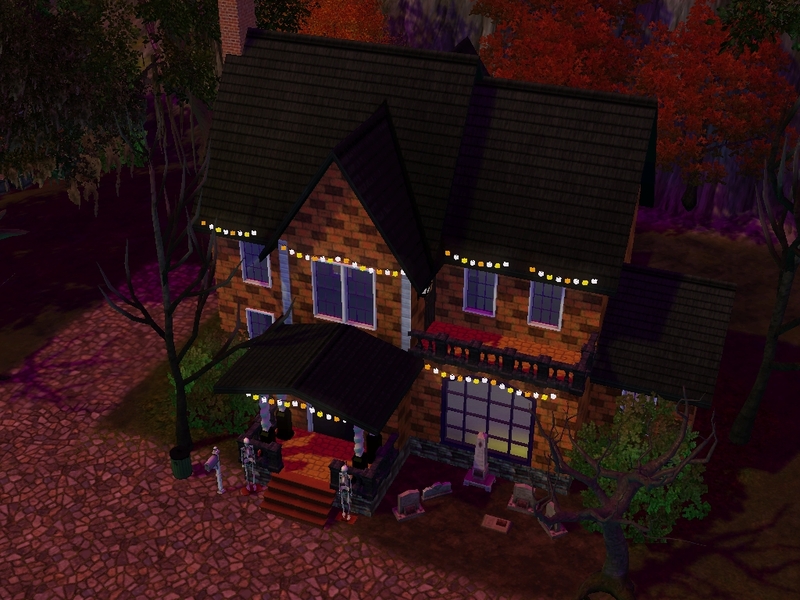 I think this looks good for a Halloween set world. One optional suggestion I might make would be to change the rabbit hole in your #30 screenshot to something with a darker color if possible(if there aren't any you like you could put in basement of small lot and build darker building on top). Love the idea of staying at the academy. Is it okay for you, to post nighttime pictures as well? I'd love to see the moon and the darkness/brightness at night. 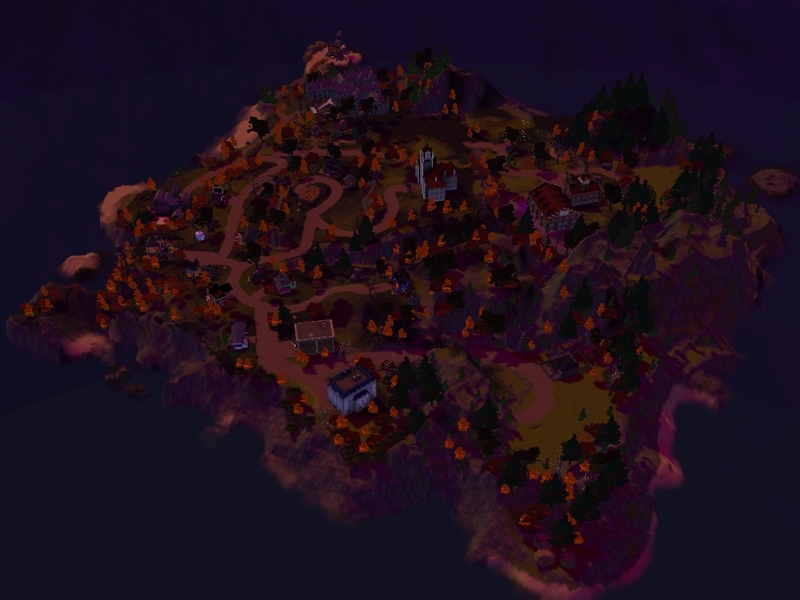 Edit2: I should write all my thoughts down and THEN make a post xD It's common that in a sims-world, there are more community lots, than residential. But 7 residential lots compared to 21 community lot is a huge gap, I think. All the community lots will be empty most of the time, I guess. That would be really sad... Is it possible to have less c-lots and more r-lots? I mean, if it would kill the atmosphere you created there, it would be sad too... hmm. 'Tis easy, you just open the rabbit hole object and export the textures you want to recolour. Then, recolour them and import them directly into your world file when it's finished. See my Jericho world (I put the resources here to download), the resources contain the image files that I recoloured which override the rabbitholes in the world when played. #16 6th Apr 2019 at 1:02 PM Last edited by pancake101 : 6th Apr 2019 at 1:54 PM. Oh that’s helpful! Thank you! So if they’re in game items already the recoulours would come packaged with the world file upon download? Looking great! I love the lots, you are using the game objects very creatively and the colors are very nice. 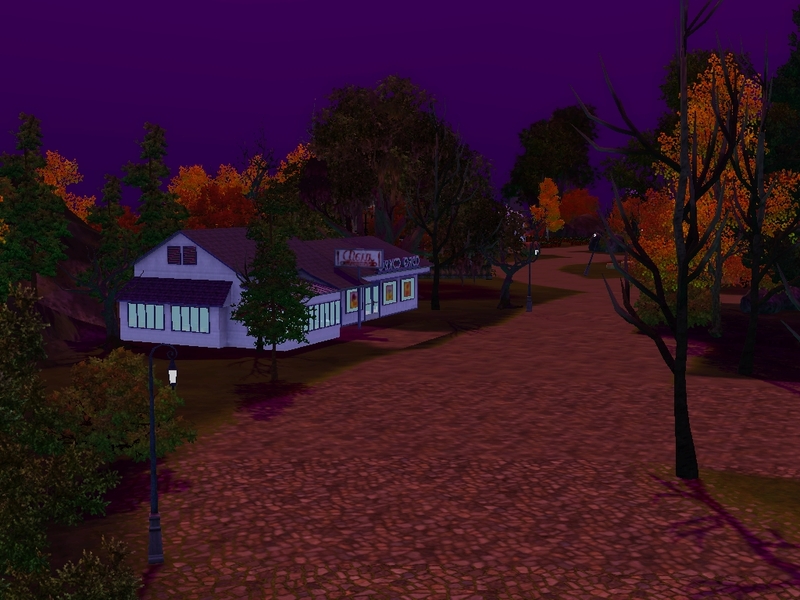 And I also love the purple sky, it creates a perfect Halloween atmosphere/mood! I agree with the feedback you've been given so far, recoloring the rabbitholes would be a nice touch. You could also use the rabbit hole rugs if you want to create a custom building, or you can place the rabbitholes in basements too. I would also add that the rock texture you are using looks a bit repetitive in some areas, so a second rock texture would minimize the effect and add some more detail and depth. We were talking via PM about recoloring the moon so I'll just reply to you here. Think of the moon as another game object, the game has IMG files for it that you can recolor too, just like the rabbitholes. Thank you! So if they’re in game items already the recoulours would come packaged with the world file upon download? Exactly! The recolored files you import into your world will only affect your world and they will also show up in other people's games when they download it. You can follow my tutorial to see all the recoloring process (I'm going to link it up here too: click here -it's in Spanish but it's very visual and easy to follow with Google Translate-). Normally you have to get the IMG files (where the image/textures of the object can be found) from the game's FullBuild files as indicated in the tutorial, but you can get the moon phases IMG files faster here because Pyronium3 uploaded them. Good luck with the world! #20 17th Apr 2019 at 5:50 PM Last edited by pancake101 : 17th Apr 2019 at 7:37 PM. Hey guys! Just a quick update with some new images of progress being made in the world. I've started on the town's residential lots, though they are still not finished yet. I've given street addresses to most all of the lots and names to the buildings. I have also started building the town gym which can be seen in the images. 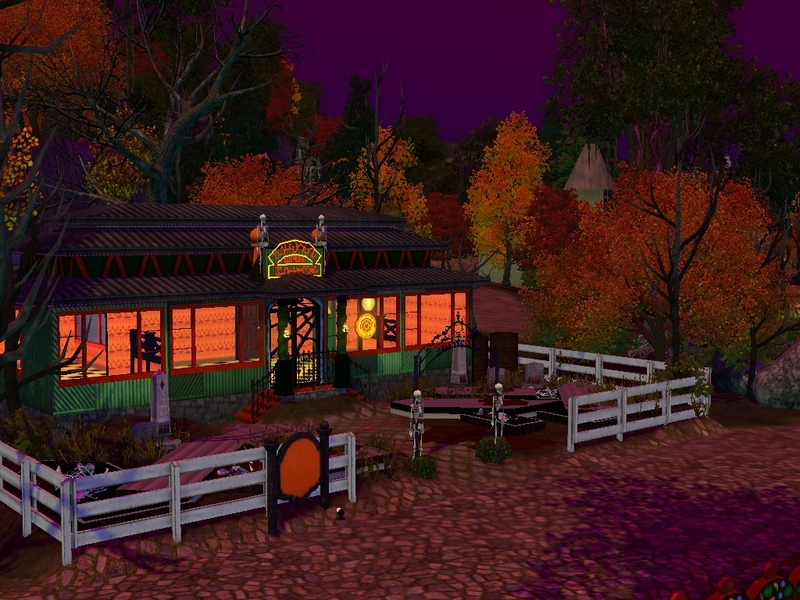 It is the orange and black building across from the pumpkin park and beside the fortune teller building. So far it's just the shell. 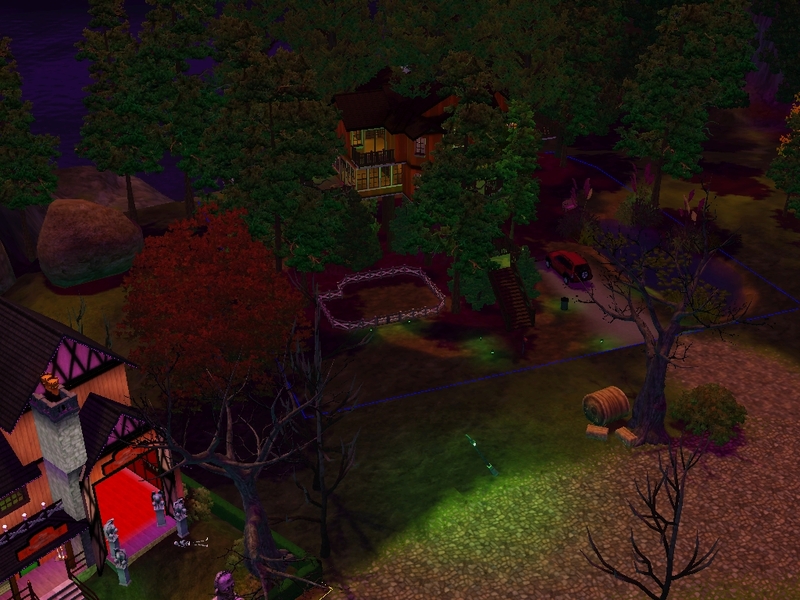 I have included some images of one of the homes under construction, along with a new area of the town that wraps around a large fishing park and includes a hair salon, art gallery, and two more homes, one being a starter trailer home and the other I decided to place as my "Cabin in the Canopy" tree house. 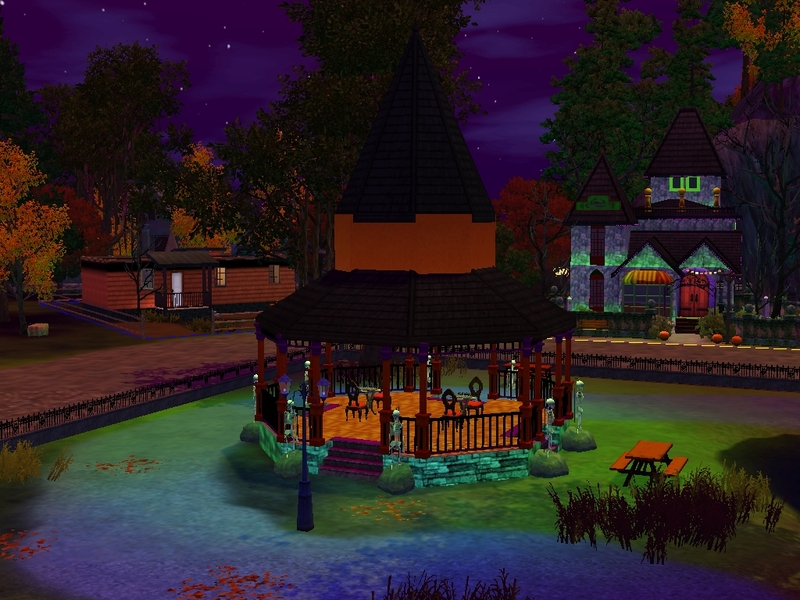 I recolored the lights and exterior to orange to help it tie into the theme The park features two witch hat gazebos, a small walking trail, and spawners for death fish in the pond. 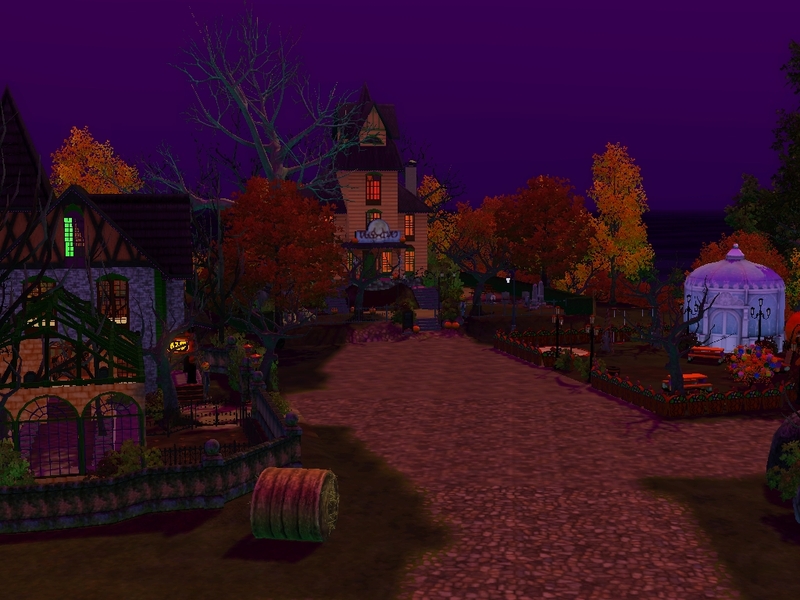 It also has fog emitters, as do most of the lots, so when played, the area fills with ground fog. 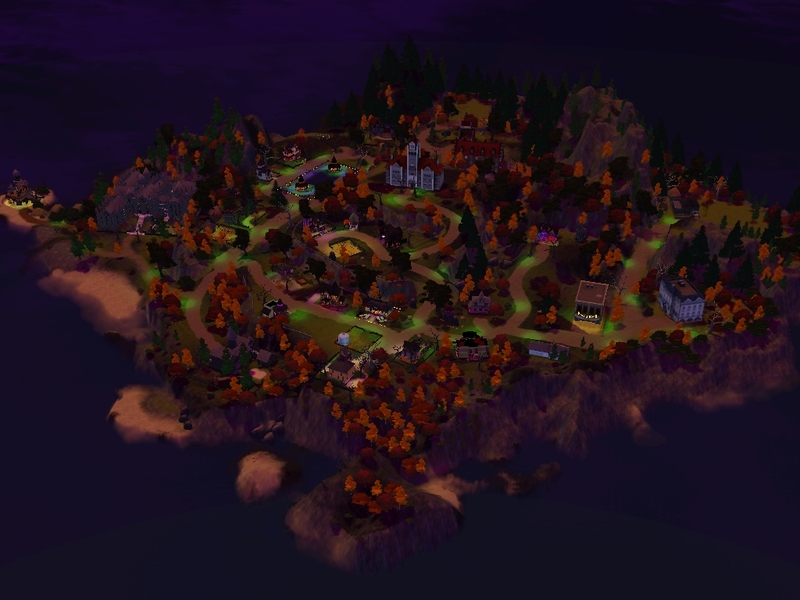 There are some night shots of the island now as well showing the green streetlights and some of the ambient lighting given to each of the buildings! I would love to hear your thoughts on it and if there is anything your think I should change, consider adding, etc. please feel free to let me know! #21 18th Apr 2019 at 9:12 AM Last edited by Fluse : 18th Apr 2019 at 12:32 PM. 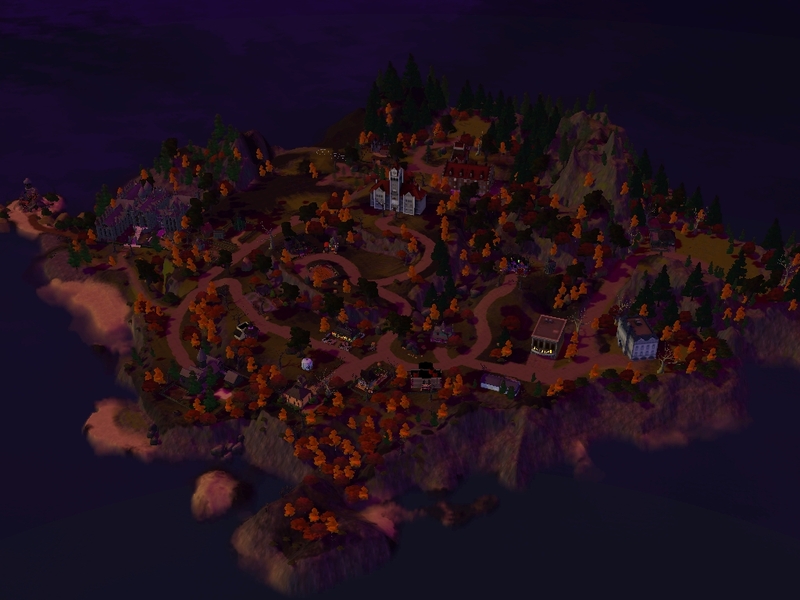 The color of the rabbithole arboretum is a bit too ea-ish for this spooky world^^, is it still the plan to recolor (some of) the rabbitholes? #22 18th Apr 2019 at 1:17 PM Last edited by pancake101 : 18th Apr 2019 at 4:11 PM. Thanks! 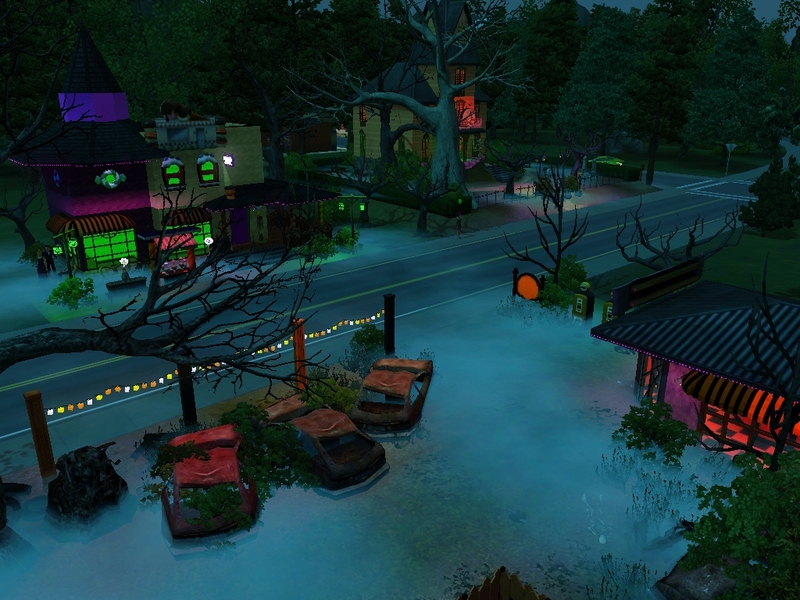 Well like the lots I built before I’m basically building this as if it were a Lemax or Department 56 Halloween village display come to life :3 I love mixing colors and wanted the streetlights to glow green to look spooky I’ll look into changing the colors of the string lights too ^^ As for the rabbit holes I will see about recolouring XD May need to collab with someone who has actual experience with that. Anyone out there who may would like to collab I’m totally open to it! I think your screenshots look better with lights on in your updated pictures. 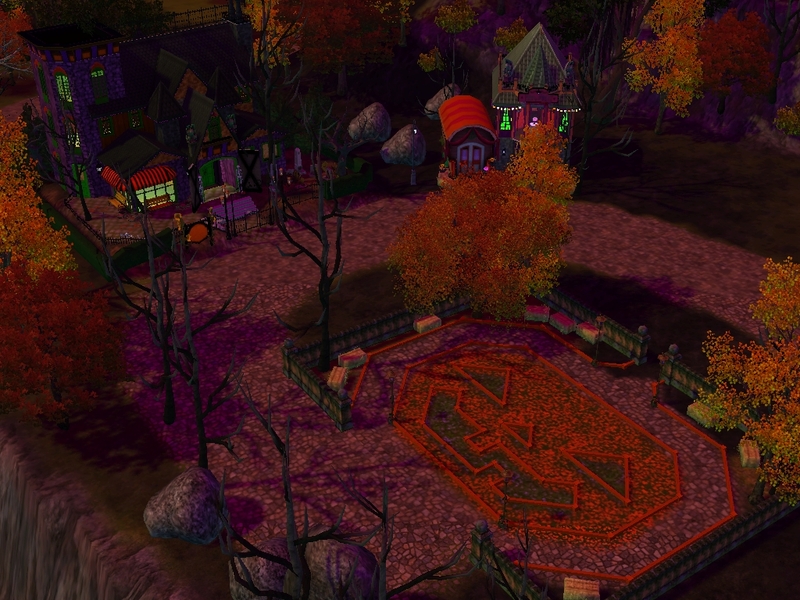 I think you can see certain areas better lit up (jack o' lantern park). I notice that your world has rolled hay decor,scarecrows. 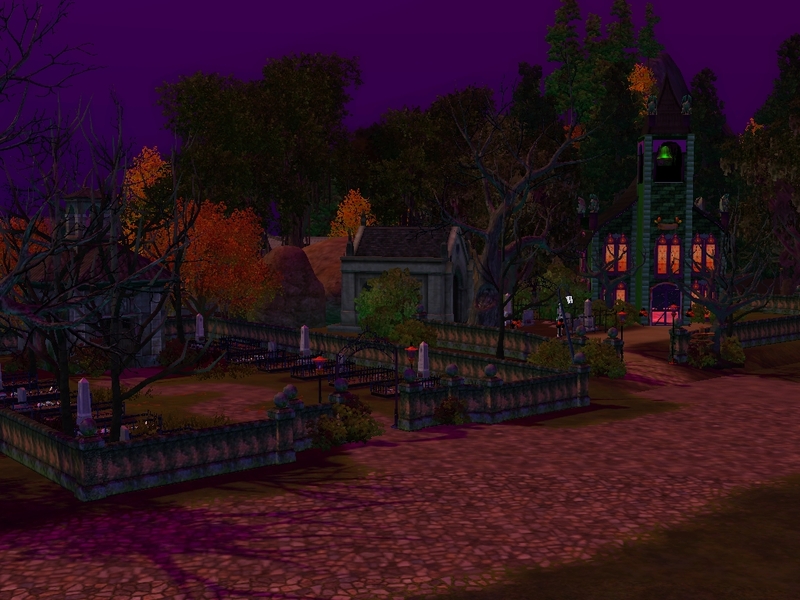 This is an optional suggestion in case you have not already implemented it, but I don't think it would be out of place to have at least one residential area as a spooky type farm for that Washington Irving/Headless Horseman vibe. Omg i love this world!! !Such a nice idea!! If you are interested i could try to help you recolour the rabbithole shells!